Ok, so I didn’t had enough time and information to blog this but most of you already know it that WHMCS got hacked yesterday. We have a long LET thread here. It seems that Matt was using HostGator services (what? why? why not a better company) to store and serve the web application. Someone got access to his HostGator account using “social engineering attack” tactics that did not involve gaining access to any email account, as per the official statement. We are writing to advise you about an incident that occurred earlier today (May 21st, 2012) at WHMCS. It appears that their servers have been compromised, including the licensing servers and ticket system. The hackers are claiming that they will shortly be publishing a dump of WHMCS’s database to the public. At this time, we are strongly advising all users to change passwords, that were used at WHMCS.com, on all other sites, as well as any server-related (FTP, SSH, etc.) credentials that you may have sent to WHMCS in a support ticket in the past. We also strongly advise that you monitor any billing methods that may currently be on file with WHMCS, this includes credit cards that we would suggest are cancelled as soon as possible. WHMCS is currently claiming that the hack has nothing to do with WHMCS itself. We are unable to confirm the extent of the attack and what information may be at risk at the current time. We strongly advise that you take extreme precautions immediately to prevent any possible consequences. I want to personally reassure you that LicensePal and the information that we hold is unaffected by this hack. If you have purchased your license directly through us, then you should not have to worry about your billing information. However, please be aware that your personal information would also be stored in their database. If you have any questions or concerns, please open a ticket and we will address it for you to the best of our ability. Thank you for choosing LicensePal. WHMCS later (after many many hours) sent this email to their customers with the subject “Urgent Security Alert – Please Do Not Ignore“. Unfortunately today we were the victim of a malicious social engineering attack which has resulted in our server being accessed, and our database being compromised. 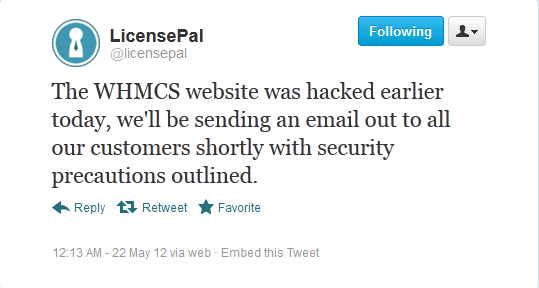 To clarify, this was no hack of the WHMCS software itself, nor a hack of our server. It was through social engineering that the login details were obtained. As a result of this, we recommend that everybody change any passwords that they have ever used for our client area, or provided via support ticket to us, immediately. Regrettably as this was our billing system database, if you pay us by credit card (excluding PayPal) then your card details may also be at risk. This is just a very brief email to alert you of the situation, as we are currently working very hard to ensure everything is back online & functioning correctly, and I will be writing to you again shortly. We would like to offer our sincere apologies for any inconvenience caused. We appreciate your support, now more than ever in this challenging time. A new WHMCS exploit scanner is being passed around IRC now. It checks for exploits on every single IP listed as active in the database. It’s not that bad now (unless you never update WHMCS), but this is going to make future exploits a bad thing. It’s not like most people are going to change their server IP just to protect themselves. 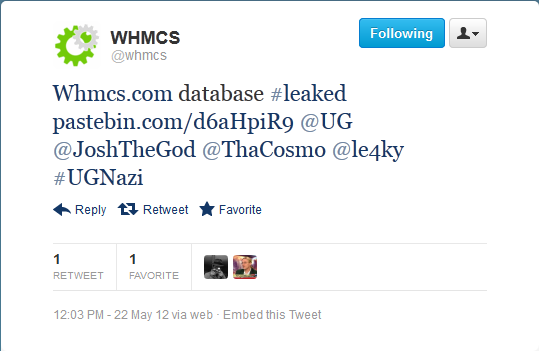 On top of all this, WHMCS was hacked again!! (see screenshot below), probably a dropped shell from the first hack? Update: Another group GearSec cracked open the identify of the initial hacker and posted information on pastebin.com. Update 2: Someone also put together a blog with all the info of the initial hacker who hacked WHMCS. why you you need it?